I'm sure all of us have heard the famous statement "nothing lasts forever", but some innovations have proved this statement partially wrong. Over the course of time Napkin Pens have changed the notion of pens and altered the world of writing instrument with their Forever series. A recent addition to Napkin's treasure trove is the new Napkin Primina collection. The Napkin Primina series share similar design with Napkin's Pretiosa and Prima models but are comparatively shorter in size, making them an ideal writing instruments to carry on the go. Though small in size, this chip off the old block includes every little quality of an ideal writing instrument and delivers the promising theme of the brand. Unlike other pens, Napkin Writing Instruments work with a different technology, these fine writing instruments use a special tip called ethergraf. For pen enthusiasts who are not familiar with the term ethergraf, it is a special metallic alloy designed for writing purpose. Ethergraf tips are free from hazardous elements like lead and graphite, and are popular among pen enthusiast who prefer inkless writing instruments. The lines drawn by ethergraf tip resembles with pencil lines but are not erasable. The functionality of these sturdy tips are quite different from nibs and ballpoint tips. When these tips come in contact with paper, the special metal alloy creates a permanent line via oxidization. The caliber of the tip depends upon the quality of paper, so if you prefer darker lines then it's best to go for high quality papers from authentic brands like Rhodia and Filofax. The new Napkin Primina is available in nine bold colors; Yellow, Orange, Red, Magenta, Purple, Blue, Cyan, Turquoise, Green. Each of these fascinating writing instrument will make a great companion and will never leave you halting in the middle of your writing journey. However, the tip does wear out overtime but the effects will be microscopic, and most of the users won't even notice the change. Upon writing, the minimalist profile of the pen fits perfectly between your fingertips and its tip leaves smooth and clean result on the paper. The ethergraf tip is as smooth as melting butter and glides perfectly on paper without getting spots of ink tattooed on your hand. The Napkin Primina collection of writing instruments are exclusively available at Pen Boutique but are flying out of our stores fast. 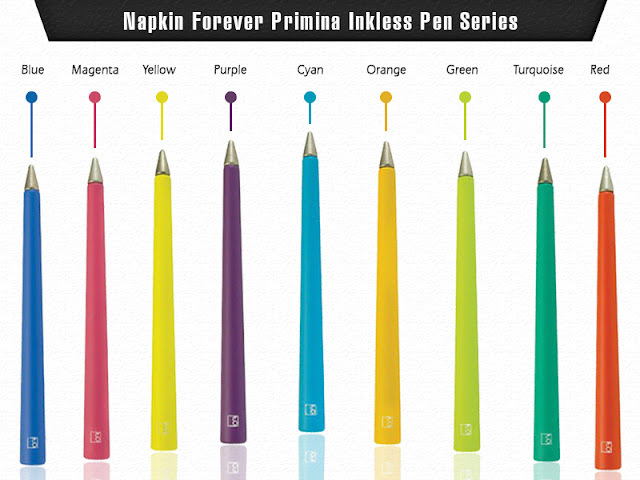 So, get your favorite Napkin Primina pen today and embark an inkless writing journey. I bought this for my son while in Italy with my husband. I thought this would be a great gift for a young artist. It lasted 5 minutes after falling off the table and onto the floor, the whole tip broke completely broke off. I thought it would have been made more durable for it tho last a life time.